Northampton Town have signed Burton striker Shaun Harrad for an undisclosed fee on a two-and-a-half-year deal. Harrad, 26, whose contract was set to expire at the end of the season, has scored 76 goals in 245 league and FA Cup games for the Brewers. 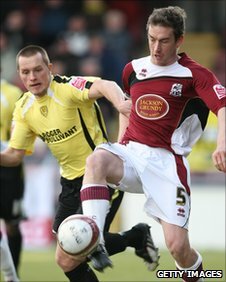 "It is well known how keen we were to bring Shaun to the club," Cobblers boss Ian Sampson told the club website. Meanwhile, Sampson has handed a new 18-month contract to midfielder Michael Jacobs, 18. On Harrad's signing, the manager said: "We have worked very hard and had to be very patient, but we have finally been able to get the deal done. "I would like to thank the chairman for allowing us to do the deal, we had to increase the original offer a couple of times to get the deal done and we did that. "Shaun is a good goalscorer, has a fantastic attitude and is the sort of player who will help us kick on." Burton boss Paul Peschisolido added: "I'm disappointed to lose Shaun because he's a fantastic player and he's scored some great goals for us. "We wanted him to stay because as a club we are building for the future and do not want to lose our best players. "We have been in discussion with Shaun and his agent but he decided to reject a new contract with Burton Albion. "He has received an offer from Northampton which would not be out of place at the top of League One or the Championship. I'm sure he'll go on to be a success at the club and we wish him all the best." Harrad started his career at Notts County, but failed to become a regular first-team starter. After a loan spell with Tamworth he joined Burton in the summer of 2005. He has amassed at least 15 goals in each of his last three full seasons, collecting his highest haul of 22 in the last campaign. Jacobs has signed an improved deal with the Cobblers, after extending his number of appearances at the club to 29 this season. The 18-year-old academy product made his debut in the Johnstone's Paint Trophy in October 2009, helping his side to a 2-1 win over Bournemouth. "We're delighted that Michael has signed this deal and its good news for the club and its good news for Michael," added Sampson. "We want him to keep learning his trade at Northampton and we're delighted to have him. "He has improved a lot over the last 18 months, and we hope he will continue to do so as he gains experience. He has quickly become an important player for us, I know he enjoys playing for the club and we are delighted he will be staying with us."